Varying results,with a nice suprise!!! 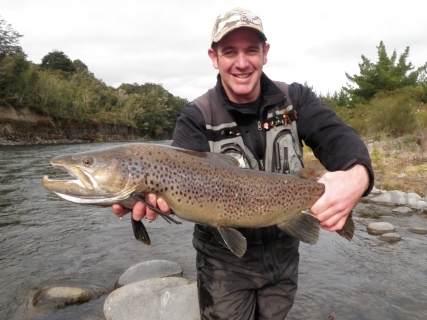 Hi again ,all rivers in the Taupo region seem to have some good trout in them but all rivers have varying reports by different anglers. The Waytahanuie has hadÂ a few fish been caught at the mouth during first and last night and also has been ok up river using small glo bugs. The keen anglers which have been sitting out there in the dark have been doing ok some nights with lumo patterns. Brian Topp has developed a black secret lumo which again knocks them dead in the middle of the night when not much is doing, he really is a talented tyer and I’m glad he’s on TRM ‘s team for the fish off this year by supplying us with killer patterns. I spoke with a very good angler which lives in the South Island most of the year but spends a couple of months here every year house sitting for his friends and gets a lot of early morning fishing in. Reports from this gentlemen indicates that the TT has plenty of great condition fish sitting at the mouth drop of waiting to enter the river when we get some rain of significant amounts. He has been down every morning for the past 6 months and never not caught trout when fishing the deep drop of. Dave seems to think the fish are in much better condition than last year and that he has had some great jacksÂ of about 6 lb which is comforting to know. David Cade – AKA Didymo Dave gave me a ring yesterday and reported his capture of rat number 212 from the banks of the Hine at Hatepe. Dave traps by himself in his own time and looks after the banks of the river by clearing unwanted weeds and bush like blackberry and other bush that bites. This man deserves a bloody medal and I wish that there were 20 of these enthusiastic kind natured guys looking after our rivers as we would be alot better of. Dave mentioned that the Hine has heaps of bird life now and he can see a drastic difference when compering the Hine to the Waytahnuie since he started his trapping program. Dave cleared another two full bags of rubbish from the Waytahnuie this week along with miles of nylon but did not see many birds atÂ all, he should start trapping creatures out there which are a menace! !lol.Â One man can’t do this job alone, you need to have balls the size of texas to just walk past the tin bonnet fence with dogs behind it. Reports from the Tongariro have been all over the place and I’m not sure what to believe at the moment with some anglers catching double figures and others getting skunked. The bit of rain we received on Wednesday may have pushed some fish in but it certainly was not enough to encourage big runs of trout. As usual guys were able to nail fish under the bridge from sunrise to sun down but good luck getting a possie-sad really. But today I joined that sad group at first light as I had received a report that over 40 fish were landed in the pool on Thursday so I decided to see for myself and fish the Tongariro for the day on Friday. The report was very correct and I joined the group of locals landing over 30 fish in a couple of hours. After a little fun and the thought of being caught fishing under the bridge I retreated to the coffee van for some warming up. It didn’t seem to matter what was thrown at these fish they would grab it and keep grabbing it, I just cant work out why they are holding in here and why they are feeding so well. It really is not my choice of places to spend the day but I must admit it’s nice to hook into fish every couple of minutes for a change. The trout were a mixed bag with some lovely fat hens but also a fair few tired lookingÂ jacks which had been about for some time. After hooking up with my best mate Mike we decided to head up river where we found most of the river to ourselves and enjoyed fishing the Stag pool with some luck every hour or so but things were pretty slow. Conditions were perfect and Mike managed to land three fish from here all on glo bugs tied on a size 14 hooks, orange in colour. This is one of my favourite pools but I got skunked in here today but that’s only as Mike kept casting over my line and giving me tangles and grief, lol. As I crossed the small stream on the right as I walked up to the poolÂ started scanning the water and to my suprise spottedÂ a big brown which was sat in the bottom of pool moving back and forthÂ and side to side . I assumed he was feeding quite well and snuck up behind him trying to keep a low profile and of the sky line trying not spook him as this wasÂ a brilliant looking trout. I put a few practice castsÂ out to achieve some distance on the line and started roll casting myÂ rig which consisted of one of Brian Topps special glo bugs towards the brown. This fish was that big I should have used BOOF as an attractor a this little glo bug couldn’t fill such a beast. I know people think that browns don’t eat glo bugs but I think I have caught enough for you to start to change your minds. After about 2o casts of not scaring the trout I was pretty certain he was going to be another that was happy playing doggo andÂ I was not going to get a reaction from himÂ until suddenly the white flash of his bottom lip inhaled the fly which was drifted on his nose and it was “GAME ON! ” Â Trembling and shaking (and almost filling my waders)Â I gathered line on the reel and got myself sorted as I had slack line over the rocks and under my feet which no good ever comes of that. The typical big brown head shakes throbbed through the rod and through my whole body before he woke up and headed down the river like many do. Big browns like this should not be stopped, you must go with them or they simply just get off due to their weight and force with the current. ThisÂ big buggerÂ was not stopping and having a waterproof camera and phone on me I was now geared up for another float down the rapid to keep up with fish and steer him into quieter water. I managed to keep my feet and bounced down the rapid into the head of the Blue Pool maintainingÂ a high rod as thisÂ is very important to keep the nylon away from rocks to avoid disappointment. Once I had the beast in water that I was comfortable with I made sure that he stayed away from the main flow with some good strong side pressure and nervous moments. If I had lost this trout it may have been one of those breaking rods over thighs and driving straight homeÂ days so I was very careful when I did and didn’t apply pressure. As I had no net (thanks Mike)Â and browns don’t turn on their sides for you , Mike was no where to be seen as I struggled to get the big fella to the rivers edge. Eventually I was able to corner the fish in aÂ rock pool and apply the size 10 boot for a landing effect which was followed by my hands firmly around his tail. 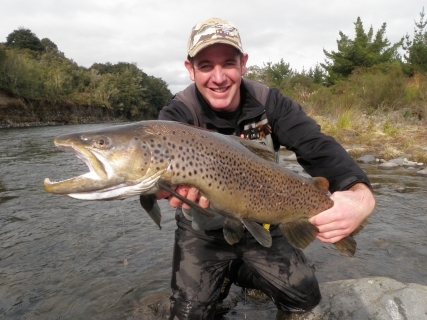 I landedÂ a double figure Brown in July from the Tongariro using a single bright orange glo bug on 6lb flurocarbon. I was so excited – as you could imagine-Â and the moment was shared with Mike andÂ a few on lookers after all the comotion had settled down. Still shaking and trembling I handed the camera to Mike for some photos and gave myself a moment to realize what had just happened, I couldn’t believe it. 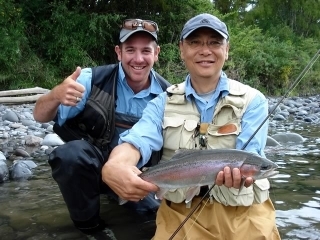 It just shows you that the mighty Tongariro is still one of the most special fisheries in the country and we are privileged to be able to fish it when we want to. There are fish out their guys we just have to explore a little to find them and get away from that bridge. Hopefully with a bit more rain they will push out of this pool and spread in the river and allow anglers to target them the way we are used to. As you can imagine the smiles still on my face so I think I may go to bed and dream it all again.